The term “extinct” often brings to mind the towering giants of the Cretaceous period; however, this is not always the case. Over the years, as we have had an increasingly detrimental effect on our environment, animal species have been facing the threat of extinction more often. The term extinct refers to a group of animals, whether it is a species, family, genus etc. that have no living members. There are many factors that can lead to the extinction of a particular creature. In the past, the World Conservation Union required that an animal be absent for fifty years before it could be officially declared extinct. These days it is a little trickier to declare an animal extinct. In order for an animal to officially be declared extinct today researchers must prove repeated efforts to survey the known habitat of the creature in question. These efforts must show with no reasonable doubt that the last animal of the group has died. The difficulty that some people have with this criterion, however, is that some species – for example insects and small rodents, are much more difficult to spot than other, larger mammals. Below is a list of 15 recently extinct animals. Sadly, the list of endangered species is getting longer every day. 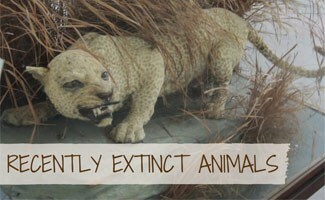 In 2012 the Zanzibar leopard was declared extinct. Also known as Panthera pardus adersi, this leopard species was native to the Unguja Island in Zanzibar. Not too much is known about this extinct leopard with only six skins of these creatures ever being found in museums. The Zanzibar leopard is believed to have been a smaller leopard specimen compared to other living species. There is one known mounted Zanzibar leopard specimen in the Zanzibar Museum. Despite only being declared extinct in 2012, the last known sighting of one of these massive creatures was in the early 1980’s. Some inhabitants of the Tanzanian island claim to have seen individual leopard’s still stalking livestock to date; however, no professional researcher has seen this big cat since the 1980’s. Zanzibari culture characterized the Zanzibar leopard as being sent by witches to stalk villagers who contributed to the massive extermination of the species. These large leopards also succumbed to their extinction as a result of having their habitat encroached upon by humans. As more humans came in to contact with the feared cats, more cats were killed in order to “protect” local villagers. While minimal conservation efforts were made to save the Zanzibar leopard, these efforts were too little and they came too late to make any impact. In 2011, the Western black rhinoceros was declared extinct. This black rhino subspecies was once very prominent throughout central-west Africa but over time their numbers dwindled. The western black rhinoceros measured between 10 and 12 ½ feet long and around 4 ½ to 5 ½ feet tall. Most characteristic of this black rhino species was the two horns that it grew, the fore-horn being longer than the back horn. This large mammal began to see a decline in population during the beginning of the 20th century as a result of poaching. As increasing numbers of western black rhino’s were hunted for their horns, preservation efforts were launched and between 1930 and 1980 their populations increased. Unfortunately, preservation efforts were not enough to combat illegal poachers who continued to decimate western black rhino populations. Researchers estimated that by the year 2000, only 10 specimens were found living. By 2006 a survey of the western black rhino’s natural habitat revealed that there were no surviving specimens. No western black rhinos are currently known to be living in captivity either. On November 10, 2011, the International Union for Conservation of Nature declared the western black rhino an extinct species. The eastern cougar was declared extinct in 2011. Also known as the Puma concolor cougar is believed by most biologists to have been a subspecies of North American cougar. Other biologists believe that the eastern cougar was a species with its origins in South America or western North America and as such the eastern cougar is not extinct, rather it is living in these areas. Despite disagreements over whether or not this species still lives, it was declared to be extinct by the IUCN in 2011. Some individuals still claim to have caught sightings of this cougar subspecies; however, officials generally recognize these sightings as being other cougar subspecies that have wandered from their native habitats. It is believed that a combination of hunting, the offering of bounties for cougar corpses and a decline in white-tailed deer are what led to the extinction of the eastern cougar. Ironically, the extinction of the eastern cougar has led to a sharp increase in the number of white-tailed deer. In 2010 the alaotra grebe was declared extinct. This 10 inch long bird was native to Lake Alaotra and nearby lakes in Madagascar. This species is also known as Delacour’s Little Grebe, the rusty grebe or Tachybaptus rufolavatus. Only one photograph of this bird species is known to exist to date. This black and brown bird had a short wingspan that restricted its ability to expand in to other territories. This species is believed to have become extinct as a result of habitat destruction, predation from the snakehead murrel and entangling themselves in monofilament gillnets. Researchers also believe that cross breeding led to unhealthy hybrid birds that diluted the Alaotra grebe gene pool. While the Alaotra grebe was declared extinct in 2010, the last confirmed sighting of this bird was 25 years prior in 1985. The Liverpool pigeon was declared extinct in 2008. First recorded in 1783, this brightly colored bird is said to have reached 12 ½ inches with a wing span of nearly 7 inches. This mottled green bird featured a bump on the base of its beak and is thought to have lived in the forests or vegetation where it was able to camouflage itself. While no substantiated reason exists as to why the Liverpool pigeon went extinct, scientists hypothesize that a lack of predators and inability to migrate from an island due to short wingspan caused this species to die out. The baiji was declared extinct in 2006. This Chinese freshwater dolphin species was once only ever found in the Yangtze River. Baiji specimens measured in between 7 ½ and 8 feet long and weighed between 300 and 500 lbs. The average lifespan of the baiji in the wild is around 25 years old. These dolphins traveled quite slowly between 6 to 9 miles per hour; however, when in danger they could move as quickly as 37 miles per hour! When navigating the Yangtze the baiji depended upon sonar skills since it had particularly bad hearing and vision. Fossil records show that the baiji first appeared in the Pacific Ocean some 25 million years ago. After 5 million years they were believed to have made the move to the Yangtza River. By the 1950’s the population of the baiji was around 6,000 but this population quickly dwindled and by 1997 only 13 specimens were known to exist. The last recorded sighting of the baiji was in August 2004. A number of factors are thought to have contributed to the extinction of the baiji: hunting, entanglement in fishing nets, electric fishing, collisions with boats, pollution and habitat destruction. The Po’ouli was declared extinct in 2004. Also known as the black-faced honeycreeper, this bird species was native to Hawaii. This unique bird was not discovered until 1973 when University of Hawaii students discovered the bird in Maui. This honeycreeper bird species was particularly unique because it was the only bird to exhibit its particular DNA structure. During the 10 year period following its discovery, the Po’ouli population dropped by 90%. In an effort to preserve the bird’s dwindling population a natural area reserve was established. Despite efforts to preserve the species only three species were known to exist by 1997. After one of these three specimens died off and the final two were not found, the species was declared extinct. While researchers did manage to take tissue from one specimen for cloning purposes, there simply was not an opportunity to do so. Biologists believe that the extinction of the Po’ouli was the result of diseases carried by mosquitoes, predation, habitat loss and a decline in food resources. The Pyrenean ibex was declared extinct in January of 2000. This Spanish ibex species was found in the Pyrenees in France and Spain. Despite having larger populations hundreds of years ago, they had already reached critical numbers in 1900 with less than 100 individuals. Within ten years their numbers had dropped again and only 40 specimens were found. The last known Pyrenean ibex specimen was discovered dead on January 6, 2000 as the result of a falling tree. The cause of the Pyrenean ibex extinction is a mystery but biologists believe that dwindling food resources, diseases and poaching contributed to their decline. In January of 2009 biologists attempted to resurrect the species through a cloning project; however, the cloned female specimen died shortly after birth due to defects in her lungs. The golden toad of Costa Rica was declared extinct in 1989. This brightly colored toad is sometimes called the Monteverde golden toad, the orange toad and the Alajuela toad. First discovered in 1966 this golden-colored toad was found in a 30 square kilometer area high above the city of Monteverde, Costa Rica. This toad was a member of the Bufonidae family. From 1966 to 1987 more than 1,500 of these toads were spotted but by 1988 only ten of the toads were spotted. By 1989 only one golden toad was noted. By late 1989 this species was declared to be extinct. Researchers believe that climate change contributed significantly to the extinction of the golden toad. In particular a significantly dry period is believed to have dried out the shallow breeding pools where golden toad eggs were laid before the eggs had a chance to hatch. The black spotted damselfish was declared extinct in 1984. Also known as the Galapagos damsel or the blackspot chromis, this fish was native to the Galapagos Islands and Cocos Islands. The black spotted damselfish measured in at around 6 inches long with a light olive color and an overlying blue tint. This fish fed mostly on plankton. In 1982 and 1983 El Nino caused increased temperatures in the waters off the Galapagos Islands. As water temperatures raised plankton production was interrupted and as a result damsel fish were unable to survive. Since the water temperature change, no black spotted damselfish have been seen and consequently the fish was declared extinct in 1984. The Caspian tiger was declared extinct around 1970. Also known as the Hyrcanian tiger and the Turan tiger, this tiger subspecies was last spotted in the wild in the early 1970’s. The Caspian tiger naturally inhabited forests and corridors to the West and South of the Caspian Sea. At one time found in Turkestan, Iran, Turkey and Afghanistan this was one of the biggest “big cats” to ever exist. The approximate length of this tiger species was 110 inches with the females measuring slightly less than this. The heaviest recorded Caspian tiger species weighed 530 lbs. This tiger was brighter in color than other tiger species and its stripes were much thinner and much more closely positioned with brown coloration. These large cats roamed as they followed prey species. The late 19th century saw the beginning of the Caspian tiger population decline. When Russia colonized Turkestan tigers became game that was hunted alongside wild pigs. As more wild pigs were hunted, tigers not only suffered from “sportsmanship” but they also suffered from a food shortage. Colonization also led to tiger’s habitat being destroyed. These large animals found themselves in increasingly confined territories with fewer food sources. Conservation efforts were made to save the Caspian tiger but they came too late and no evidence of this species has been found since the early 1970’s. The Arabian ostrich was declared extinct in 1966. Also known as the Middle Eastern ostrich this subspecies was native to the Arabian Peninsula. This ostrich played a significant part in Middle Eastern culture, being depicted frequently in text and graphics. These birds were frequently hunted for sport as well as for food. Hunters relying upon bows and arrows to kill the ostriches would frequently miss their targets and allow populations to continue to thrive in the area. When firearms and cars were introduced to the area however, the population of Arabian ostriches began its decline much more sharply. The introduction of firearms in particular led to increased hunting of these large birds and by the beginning of the 20th century this creature was rare. By 1966 the last of this species was discovered north of Petra and shortly thereafter it died. No specimens of this species have been found since. The Cape lion was declared extinct in 1963. This lion subspecies was recognized as the second largest lion species to ever have existed. Weighing in at around 500 lbs, the Cape lion could reach up to 10 feet long. Both the tips of the ears and the mane were solid black in color. These lions were native to South Africa around the Cape particularly in Cape Province. These large lions fed on antelopes, giraffes, buffaloes and zebras. These lions got a reputation for being man eaters due to their size as well as the fact that older lions with bad teeth are recorded as hunting down men. One of the last sighted Cape lions in South Africa was killed in 1858. As Europeans moved in to South Africa, the Cape lion population fell quickly as a result of hunting. Some believe that the influx of Europeans also led to a reduction in the lion’s natural food source, but likely the majority of these lions were hunted in to extinction. Cape lions managed to survive in captivity for a while after they had vanished from the wild. In 2000, despite the fact that these lions had been declared extinct, two possible Cape lions were found in captivity in Russia. Questions still remain as to whether these were actually Cape lions or whether they were darker long maned lions. The Caribbean monk seal was declared extinct in 2008. Also known as the “Sea wolf” this seal was native to the Caribbean. Despite the last specimen of Caribbean monk seals being spotted in 1952, it wasn’t until 2008 that this species was officially declared extinct. For five years the National Oceanic and Atmospheric Administration and the National Marine Fisheries Service scouted for this seal specimen to no avail. These close relatives of Hawaiian monk seals could grow to as long as 8 feet and weigh as much as 600 lbs! The long bodies of this seal species were robust and set them apart from many other seal species. These seals often had a green tint to them as algae grew on their skin. Feeding on fish and crustaceans, these seals congregated in groups on land and showed little fear of man. This lack of fear and curiosity led to the decline in the Caribbean monk seal population. These seals were frequently hunted for their oil. Along with being hunted, this seal species also suffered at the hands of those who would bring it to live in captivity. The Caribbean monk seal showed a particular inability to survive captive life. Biologists also believe that overfishing led to a sharp decline in food resources that led to a sharper decline in already dwindling species numbers. Curious to learn more about recently extinct animals? This 10-minute video has an overview of ten popular animals that have recently gone extinct. What do you think will be the next animal to go extinct and why? Thanks Amy, I haven’t heard of many of these animals though. No wonder they are extinct then!